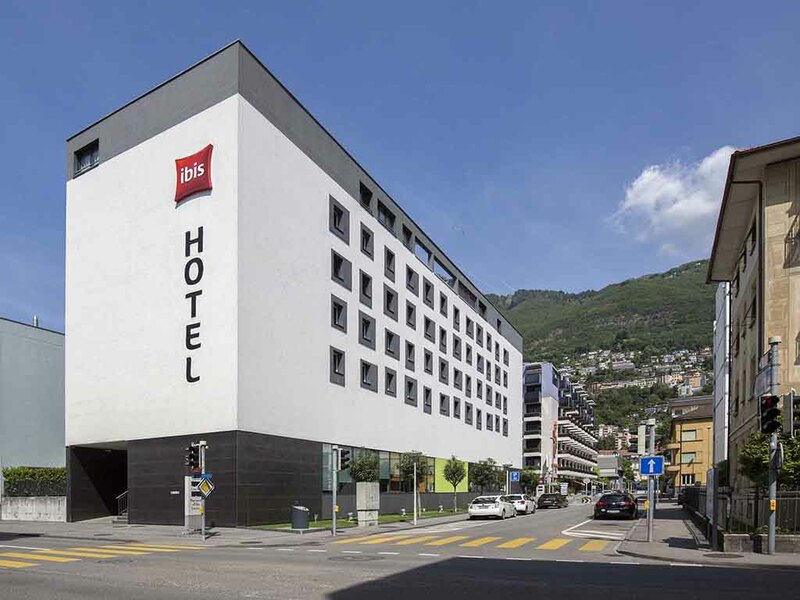 The ibis Locarno is located in the heart of the town of Locarno, just a few minutes' walk from the lake, the ferry terminal, the Piazza Grande and the casino. The 3-star hotel is 100% non-smoking. The hotel is fully air-conditioned and has 83 rooms, of which four are for people with reduced mobility and three are suites. There is also a 24-hour bar serving snacks, a sauna, a business corner, a welcoming breakfast area and an indoor paying car park. Free Wi-Fi access. Relax in the bar: go along to the ibis bar at any time of the day and take time out to relax. Easy check in, friendly staff, late check-out was allowed, as well as secure place to store bag until later. Breakfast was very good (fresh orange juice, eggs, yogurt, honey, breads, cheese...). The room was a good size, clean (best! No carpet!) quiet, comfortable bed, very good shower. We didn’t use the sauna but will next time. The hotel is very close to the train station, the sea, and the mineral bath and 25m pool. The area is wonderful for jogging. Really a lovely getaway in winter from Zurich. Locarno is paradise. Very spacious and well equipped room, with even a XMas tree. Cleaning of the room, however, needs improvement: dust under and around the main bed, hair in the carpet, WC not properly cleaned. Was a very pleasant stay with a wonderful surprise. The suite was immaculately cleaned as usual and the staff were friendly and very accommodating. We were also pleasantly surprised with a beautiful welcome display in our room consisting of fresh fruit, chocolates, cheese, balloons, a dog bone and bowl for our golden retriever. This really made us feel very special and we felt like valued guests. We also enjoyed our breakfast in the room. I liked the bed and the bathroom. Thank You for the uncomplicated, free WiFi. The staff rocks! They are extremely friendly, fun and very pleasant to deal with! Perfectly clean and fit for business trip purpose. Brilliant personnel. The hotel is located close to the city center, shops and the company I am visiting, so location is perfect. The room is basic, but spacious and perfectly clean. The personnel is helpful and kind. Clean and very well located, close to Lago Maggiore. To the city center, you only have to walk a few steps. The unit is clean but oldfashioned and I am sure that when Accor Group decides to renovate this unit to the new image of IBIS, it will be a success. We arrived and were met by friendly staff and checked in quickly, the room was very clean with a comfy bed, the shower was was good. Breakfast was well stocked in the morning even with the hotel being very busy. We had a meeting on the Monday morning and the staff were helpful in looking after our luggage. We have stayed there before and are glad to see the standards are staying high. Would recommend. Hotel stays not far from center of Locarno. Easy & comfortable to stay with. Have stayed here before and always receive good and friendly service. Satisfied! Something still missing for 3 guests. Unconvenient for the 3rd person who sleep in living room. Sofa bed is uncomfortable. I think, it’s better, to set a quality extra bed. Btw, have a lot Walldorps for put stuffs. Good experience. Simple room but clean and pleasant Service at reception ok Useful small fitness room. Extremely friendly, happy and helpful receptionists, very flexible. Made things very easy to handle.